We Austrian economists frequently cross swords with our Keynesian foes on all manner of economic analysis and government policy recommendations. Yet the standard Austrian analysis of the business cycle is also sharply at odds with that of the “Market Monetarists,” a new school of thought coming out of the Chicago school tradition and now gaining traction at places like the Mercatus Center. In particular, prominent Market Monetarists have challenged the Austrian narrative of the housing bubble, arguing that the claims of “malinvestment” and the need for reallocation of resources do not fit the data. Yet as we’ll see, it’s the Market Monetarists who are defying common sense with their alternate version of history. When I first started blogging, a number of Austrian commenters told me the real problem was not tight money. Rather there had been “malinvestment” in housing, especially in the “sand states”. The recession was the price we had to pay for all of this poorly thought out investment. But focus now on the part I’ve put in bold in the block quotation from Sumner. He seems to think this is a radical departure from the Austrian perspective, when in fact it’s not at all. Indeed, that’s what many Austrians would have said they meant by “malinvestment.” A related feature would be that many houses were built that were too big. So contrary to Sumner’s perspective, when the Austrians speak of “malinvestments” during the housing boom years in the mid-2000s, they weren’t predicting that Las Vegas would be a ghost town for the next 30 years. Rather, they simply meant that too many houses were being built ahead of schedule, and further that many of these houses were bigger than they should have been. For an analogy, Austrians would also say the moonshot under President Kennedy was a gross waste of resources. Yet someday, private companies will no doubt be profitably sending passengers and cargo from Earth to the moon. The fact that the moonshot was merely “too early” in the 1960s doesn’t change the fact that it was a bad investment—a misuse of scarce resources—at that time. To repeat, Austrians like me have been jumping up and down since 2008, warning people that Bernanke was blowing up giant asset bubbles just like Greenspan had done after the dot-com crash. So how in the world is the above chart supposed to show that the Austrians have been wrong? If we were right, isn’t the above chart exactly what things would look like? Sumner thinks there was a “construction slump” from 2006-07, and yet “resources did shift to other sectors,” because in January 2006, housing starts were 2.3 million while unemployment was 4.7%. But by April 2008, housing starts had plummeted to 1.0 million, yet unemployment was only 4.9%. This is why, to repeat, Sumner thinks the Austrian “reallocation story” makes no sense. In Sumner’s view, apparently the economy was able to jettison a huge portion of workers out of construction into other sectors, so long as the Fed kept nominal GDP chugging along, but once the Fed inexplicably tightened monetary policy, that’s when unemployment spiked. Yet as I explained at the time, there’s a huge flaw in Sumner’s argument. It’s true that housing starts collapsed from January 2006 to April 2008, but that’s not true of construction employment, which fell from 7.6 million to 7.3 million. Even though housing starts fell by 57%, construction employment during that period only fell by 4%. 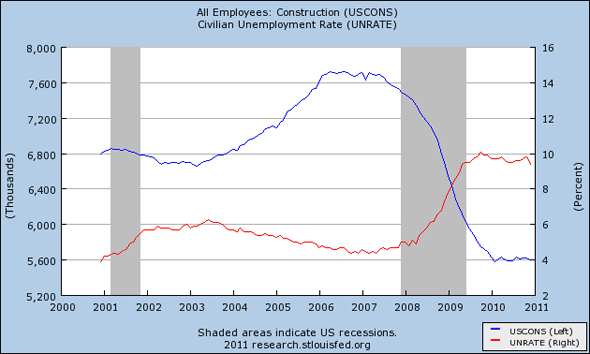 The following chart plots total construction employment (blue, left axis) against the national unemployment rate (red, right axis). Doesn’t this look exactly like the Austrian story? Regarding the above chart, I’m not merely referring to the tail end when the crash happened. Even going intothe crazy bubble years, the above chart fits the Austrian story beautifully: As construction employment surged (blue line), rising from 6.7 million in early 2003 to 7.8 million by early 2006, the national unemployment rate (red line) fell from 6% to almost 4.5%. And then, when construction employment really did start plummeting—which happened well after the point that Sumner would have you believe—that’s precisely when the national unemployment rate starts rising rapidly. What would the chart need to look like, to vindicate the Austrians? Let’s also remember a point that came up in one of my battles with Krugman. Krugman (like Sumner) had tried to pooh-pooh the “real resource reallocation” story of the housing boom/bust by pointing out that as of the end of 2008, year/year increases in state unemployment rates didn’t seem to match up with those states that had had the biggest housing price collapses. But as I pointed out in my response, the housing bust (as measured by prices) had been well underway at the start of 2008, and so it was odd to use that as the start date. If instead we looked at the states from the peak of the housing price bubble, i.e., June 2006, through December 2008, then we found the following: Of the six states with the biggest drop in housing prices during this period, five of them were also on the list of the six states with the biggest jump in their unemployment rates during this same period. So that seems hard to reconcile with a theory that blames the recession on a drop in Aggregate Demand (Krugman’s story) or “passive tightening by the Fed” (Sumner’s story). Yet after the bust, most people realize that they are poorer than they had thought. Workers get laid off from their desired jobs, and now have to decide which of less attractive options they are going to pick. There is uncertainty of course, as employers and unemployed workers engage in a giant process of search and matching. It’s not mysterious at all that during such an upheaval—and especially when the Fed and Bush/Obama administrations are wasting hundreds of billions while violating contractual arrangements—even people who kept their jobs would reduce their discretionary spending, and sectors all throughout the economy would scale back operations. And so we’ve seen that Scott Sumner’s pushback against the Austrian view doesn’t really make sense. However, at least Sumner had the decency to admit that there had been too much (or at least too early) housing. The reader can hopefully see why Erdmann’s thesis poses such a problem for not just the Austrians, but for most other analysts who have thought there was an artificial boom in housing from (say) 2002–2006. On the face of it, Erdmann is trying to demonstrate that if we use an objective measure, then it seems there was nothing unusual—from a historical perspective—about the growth in the stock of housing in the mid-2000s. 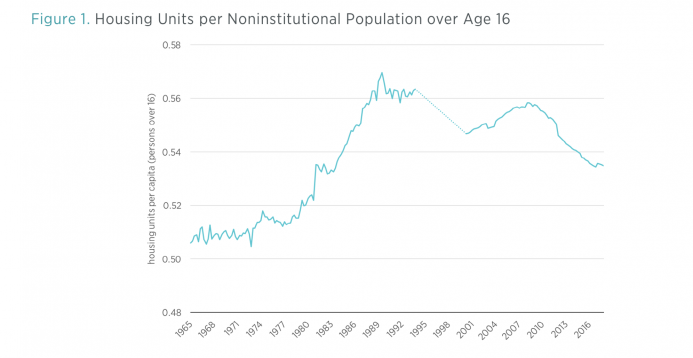 After all, even at its recent peak, the particular measure of “Housing Units per capita” was still lower than it had been in the late 1980s. There are several responses I’ll give to this line of argument. First, who’s to say that the level in the late 1980s was correct? 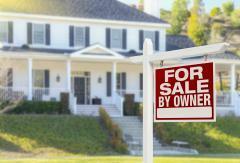 After all, there had been a devastating crash in the real estate market (and related crises in banking) following the “closing of loopholes” in the 1986 Tax Reform Act. A third problem is that houses nowadays are much bigger than they were in the 1970s. Mark Perry reports that for new homes (of a certain category), living space per person has nearly doubled since 1973. A much more revealing statistic, then, would be something like, “Housing square footage per capita,” which I imagine would have been at all-time highs circa 2007 (though I couldn’t find the data needed to either back up or reject my hunch). Finally and perhaps most serious, is the problem that Erdmann is playing central planner. We can’t look at aggregate statistics like “housing units per person” and decide whether “too much” or “too little” housing has been built in the country. If we could, then the socialist calculation problem would be a snap to solve. Nobody denies that there was a tremendous surge in home prices up through 2006 or 2007 (depending on the index you use), followed by a large crash. How could such a volatile movement not have influenced actual investment decisions? Don’t Erdmann (and Sumner) think market prices guide entrepreneurs? As the chart indicates, from 2001 to the eve of the recession’s official start, the number of vacant housing units increased from 13.9 million to 18.6 million. That certainly seems like “overbuilding” beyond what “the fundamentals” would justify. Over the years, the number has fallen, but slowly. Isn’t this exactly what the “housing supply overhang” story would look like? Maybe there are some real-world on-the-ground facts about the housing market that Erdmann’s preferred statistics are failing to capture. Of course, I’m being facetious. Obviously, there were plenty of other changes in the oil industry over the last 50 years, so that you can’t simply look at a crude (no pun intended) statistic like “annual crude oil consumed per capita.” Among other problems, there were various layers of price controls on both gasoline and crude oil during the 1970s, which were responsible for the supply misallocations and the infamous lines at the pump. Contrary to the claims of the Market Monetarists, the Austrian story fits the facts of the housing boom—and bust—much better than their preferred narrative.